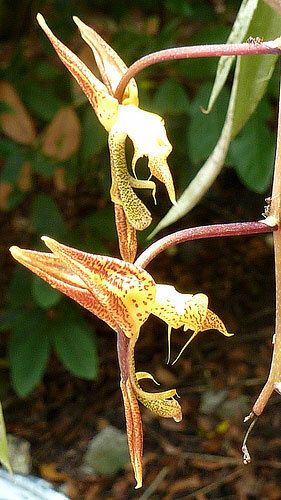 The Gongora orchid genus, named in 1794 by Ruiz and Pavon in honor of viceroy Antonio Caballero y Gongora of New Granada, is a group of 65 orchid species in the Stanhopeinae subtribe (see Stanhopea for more.) They have long, pendulous inflorescences that hang over the edge of the pot; many people hang the pots, or grow them in hanging baskets. The flowers point downwards, and are often attractively spaced along the flower stem. There are several to dozens of flowers per stem, and each growth can produce multiple flower stems. They are fragrant orchids, commonly smelling of cinnamon, allspice, or nutmeg. They have enough fragrance that they will often fill a greenhouse with their perfume. The scent is actually an important part of their reproductive strategy, as it attracts male euglossine bees that need to collect it to attract females. They like bright, indirect light, about 3000 footcandles. Light should be similar to Cattleya lighting, for instance. They will tolerate less light, (even dim Phalaenopsis lighting) but the leaves will grow more horizontally and darker in color, to compensate. Temperatures should be intermediate to warm, 70-85°F (21-29C) during the day, dropping 10-15°F (6-8C) at night. They like 50-70% humidity, and like a lot of water; don't let them dry out, and perhaps water as often as daily. A good potting mix for these epiphytes retains some moisture but is quite breathable; try New Zealand sphagnum moss, fine fir bark, coconut husks, or osmunda. In nature, they often grow in ant nests high in trees. When repotting, try not to break the fine roots, which branch often and go throughout the potting mix. They also make spiky aerial roots to catch leaves and other detritus; you don't have to bury these, especially if that would require you to bury the ridged pseudobulbs. Fertilize well, particularly when they are actively growing.